The Northeast Corridor Track Modernization Program is a series of projects to improve the tracks along the NEC. The work is taking place now through mid-December and starts again in early March of 2019. The end result of this work will be a more reliable ride with improved ride quality. 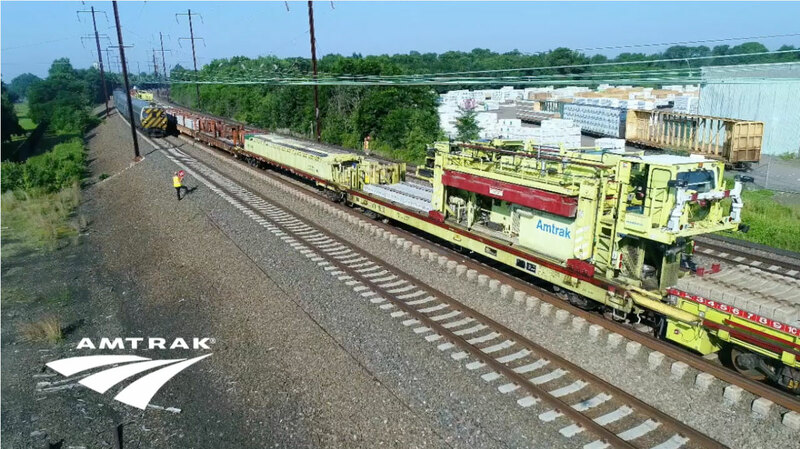 During the course of 2018, Amtrak expects to replace over 80 miles of welded rail, install over 110,000 concrete ties, and tamp over 300 miles of track in the Northeast Corridor. How will it impact my commute? If you travel along the NEC regularly, you may have already noticed your train slowing down along certain sections of your journey, large yellow construction vehicles on the tracks or several men/women with yellow vests standing trackside. Wonder what this is all about? Amtrak is working on the railroad. As a result of our maintenance efforts, some train schedules have been adjusted and additional delays are possible as segments of track are removed from service or train pass work areas. What kind of work is being done? Amtrak has a full fleet of construction equipment to aid in maintaining the railroad. From the track laying machine, to the tamper, see below to learn how Amtrak is working to improve the NEC. To check the status of your train or to modify existing reservations, visit Amtrak.com or the Amtrak mobile app. Amtrak uses several machines to improve the tracks in the NEC. You may see some, or all of them on your journey along the NEC. A track worker holds a railroad worker protection sign indicating to trains that workers are in the vicinity. An overview of the operation demonstrates the TLM dropping new ties and replacing the rail. The tamping machine is used to tamp new ballast (rocks, etc.) down in order to compact the ballast to better transmit and distribute the load of the track and rolling stock to the subgrade below. Before these machines existed, this work had to be done by hand, mile by mile. This machine can also correct the alignment of the rails making them more parallel and level, resulting in a smoother ride. And the tamping machine tamps it down.